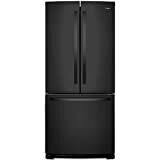 What are the Top Rated French Door Refrigerators? French door refrigerators are the most raved about style since its release because it is very conventional and classy at the same time. What makes the French door refrigerator from side-by-side doors is that the freezer is located separately from the entire fridge. It can be accessed by a pullout drawer at the bottom. Located on the top is the main refrigerator body, which can be accessed by twin doors. This design is very roomy and you can fit in wide casseroles and plates, or even pizza boxes, something that was difficult to do in side-by-side fridges. Also, food items, especially the ones that you often reach for, are easily accessible because they are at eye level. Like buying any major appliances, a French door refrigerator can greatly affect your budget because it is expensive compared to other kinds of refrigerators. It can easily go beyond the $2,000 dollar-mark so make sure that you are sure of the refrigerator that you will pick. Take some time reading through reviews and look at different brands and their features before finally deciding on the best one. 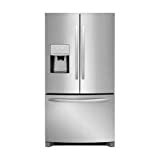 To help you with your search, we have listed top-rated French door refrigerators found on Amazon. This list should give you an idea of what’s out there in the market and how well customers receive them. This refrigerator is rated 3.3 out of 5 stars. This fridge has a total of 20.5 cubic feet capacity with 10 cubic feet DuraBase freezer drawer. The left side door of the fridge has a Slim SpacePlus ice system with tall ice and water dispenser. It features a SmartCoolingPlus system that maintains superior humidity and temperature level and the FreshAir filter helps keep the air around your food from getting stale. The freezer is very roomy, with three tiers for easier organization. LED lighting is also installed. This refrigerator is rated 4.0 out of 5 stars. It has a total capacity of 25 cubic feet. It has an additional drawer that is a bit smaller than the main tiered freezer drawer below it. Installed in one of the double doors is a water and ice dispenser that doesn’t take up too much space inside, so you can still use the racks on either side of the door. There is temperature control in the middle drawer, which makes it good for storing deli/snacks as well as fruits and vegetables. The motor is fairly quiet and it is also energy-star rated so you won’t have to worry about soaring bills. 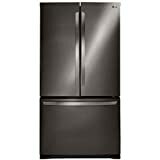 This refrigerator is rated 4.5 out of 5 stars and is available in three finishes: Black, Stainless Steel, and White. It is a 36” standard-depth refrigerator with a total of 28 cubic feet capacity. It is great for big families who need large storage area for party trays and box of pizzas. Some features worth mentioning about this fridge are the Pure Advantage Filtration system that keeps clean filtered air circulating inside the fridge so you’ll be sure that your food items will stay fresh and crisp and the Luxury Design Lighting that beautifully illuminates the interior of the refrigerator. This refrigerator is rated 3.8 out of 5 stars. 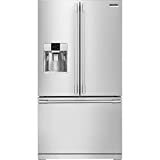 It has the same appearance as the Whirlpool French door refrigerator because it has the same pull out drawer for fruits and deli, to keep them fresh and crisp. This fridge is big – it has a total of 31 cubic feet capacity. Samsung refrigerator features a twin cooling system that helps with the airflow inside the fridge to keep your food from going stale. It also has a near commercial grade humidity levels that prevents food from spoiling and drier freezer air that produces better-tasting frozen food. It comes with an ice and water dispenser that can produce up to 10 pounds of ice per day. This refrigerator is rated 4.0 out of 5 stars. This is a counter-depth refrigerator; meaning you can align it easily to your standard sized existing cabinetry to give the fridge a more seamless and “installed” look, although no installation is necessary. It has a total storage capacity of 22 cubit feet and has an ice and water dispenser installed on the left door. The interior of the fridge contains several roomy tiers to hold big platters as well as effortless glide crisper drawers for your fruits, vegetables, and deli. The shelves feature SpillSafe “flip up and slide under”. The only con for this refrigerator, as known with most counter-depth refrigerator, is that it has a relatively small storage area compared to the kitchen space it consumes. For large families, the size of this refrigerator may not be enough. Key Takeaway: The reviewers of expensive appliances on Amazon are very low; most products only get about five reviews or less as very few customers completely trust what they see online. Most of them would still like to go to actual stores to visit and completely examine the French door refrigerators. No one could blame them though; with a purchase of over $2,000, you really want to see where your money is going. Make sure to check out several models of French door refrigerators and look at the reviews and ratings left by other customers. More or less, you’ll have an idea of what it’s going to like to own a certain brand of refrigerator, without actually having to try it first hand. This is important so you’ll be sure about your purchase. French door refrigerators are very expensive and you won’t want to waste money, time, and effort returning it if it didn’t suit your needs.